We visited this Locomotive on 8 September 2005 at the Bethlehem museum. Unfortunately this locomotive is not anymore accessible to the public at this location - in April 2008 this locomotive became part of the Sandstone Heritage collection. The good news then was that there were plans to restore the locomotive back to working order for proposed use on a section of the Bloemfontein-Bethlehem line. This ubiquitous class of locomotives was originally designed by the locomotive superintendent of the Cape Government Railways (CGR), Michael Stephens, in the late 19th century and a number of variations were placed in service between 1893 and 1904. Construction of the Class 6 locomotives was by a number British and American builders. The first examples were delivered to the CGR (Cape Government Railways) but in 1896 the OVGS (Orange Free State Government Railways) ordered a number of examples from Sharp, Stewart and Co in Glasgow. of which No: 544 was the fourth built as works number 4141 of 1896. The loco was numbered as OVGS no: 73. 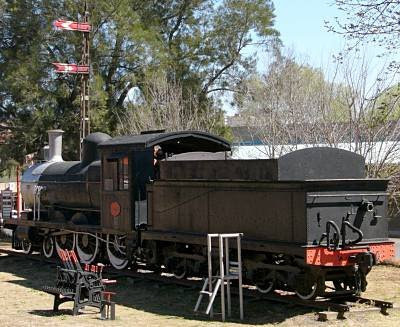 Following the Anglo-Boer war, Central South African Railways (CSAR) took over the OVGS and the locomotive was renumbered as CSAR no:349 of Class 6L-2. As with many Class 6 locomotives, No: 544 has been fitted with a Belpaire boiler during its life to increase its performance. On the formation of the South African Railways in 1910 the locomotive was renumbered 544 and reclassified as 6C. No. 544 is in excellent condition having received some major repairs at Bethlehem loco shed prior to its transfer to the museum some 30 years ago. No. 544 is now at Sandstone and awaiting restoration as the last existing locomotive of the OVGS. NOTE: The text used above was mainly sourced from a now non-existent Sandstone webpage, where you may follow the further history of this locomotive. The locomotive has been given a new protective coat at Sandstone. Currently (August 2010) the only reference to the loco I can find is here.